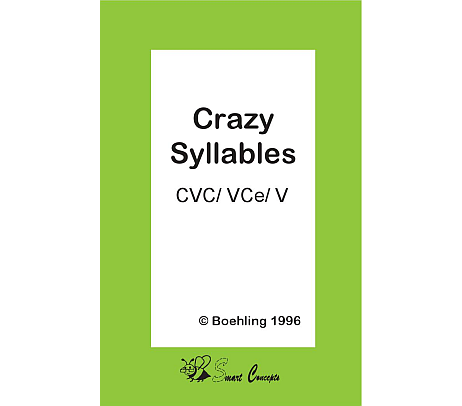 Crazy Syllables CVC / VCe / CV consists of words in the closed syllable, silent e syllable, open syllable and is played using those three categories. 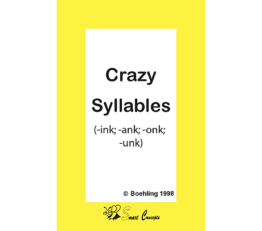 Crazy Syllables was designed to reinforce word identification at the single syllable level. The speed and accuracy of word identification is the first step toward fluency. Each deck of cards consists of words to be discarded in categories by vowel sound or syllable pattern. Each player is dealt 8 cards and competes to discard his/her hand first. The games can be played with 2 to 4 players. 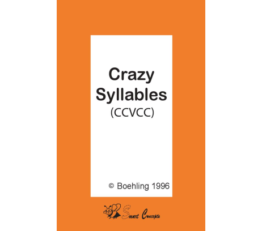 Crazy Syllables CCVCC consists of short vowels with blends in words using the closed syllable pattern. 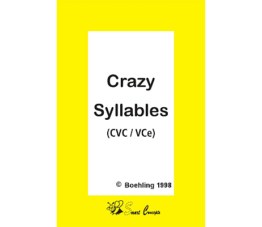 Crazy Syllables CVC/VCe consists of words in the closed syllable and silent e syllable and is played using those two categories. 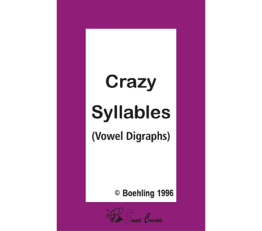 Crazy Syllables with vowel digraphs is played using most common long vowel teams: ee, ea, igh, oa, ai.